LONDON: A platoon of cadets at the Royal Military Academy Sandhurst (RMAS), led by a Pakistan Army Major, has been declared as the best platoon of the course this year for displaying outstanding skills – and Her Majesty The Queen has praised him for the “outstanding achievement”. 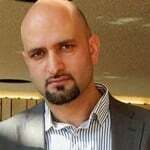 Major Umar Farooq from the Pakistan Army joined the British Army’s military academy last year as an instructor – taking over from Major Uqbah, who returned to Pakistan last year after serving as the first Pakistani military instructor. UK’s Chief of General Staff Gen Mark Carlton Smith was the chief guest. Sovereign’s Parade of Commission Course 173 was held at the Royal Military Academy Sandhurst on Friday. Major Umar Farooq was the platoon commander with this course and trained cadets over the course of a year. Out of eight platoons, his platoon was declared as the best platoon of the course at the ceremony, which was attended by a large number of people, including retired and serving military officers, families of cadets and ambassadors from dozens of countries. 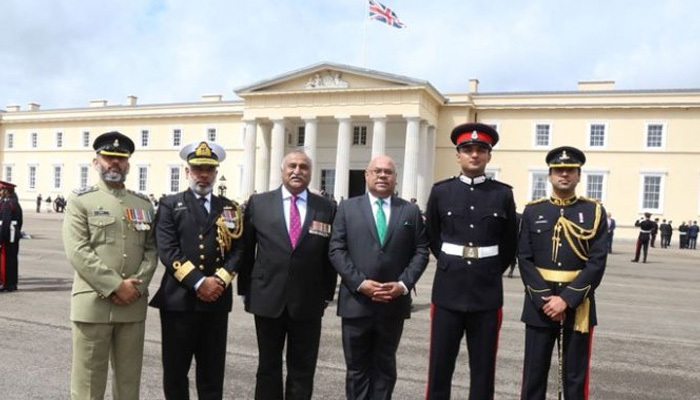 Pakistan High Commissioner Sahebzada Ahmed Khan attended the parade and congratulated Major Umar Farooq and his platoon on achieving this coveted position. In recognition of his outstanding performance, Major Umar Farooq has received a letter of appreciation from Her Majesty the Queen. His name has been written on the Sovereign’s Platoon board in the Royal Military Academy library, which is an honour for Pakistan Army. This correspondent has seen a copy of the appreciation letter sent by the Buckingham Palace to Major Umar Malik.Her Majesty The Queen wrote that she was “delighted to learn that Number 12 Platoon The Somme Company has won the Sovereign’s Banner Competition this term”. Major Umar Farooq is from the 44 SP Artillery. Before coming to RMAS, he has served in Pakistan Military Academy, Kakul, as an Adjutant and Platoon Commander. At the parade, the 173rd Commissioning course passed out and two cadets from the Pakistan Army were also part of the commissioning course.